For my initial experimentation with this recipe, I chose 100% organic palm oil shortening because others have reported success using it as a butter substitute in egg-based IMBC — it’s creamy and luxurious, and creates a buttercream with a lovely texture, which pipes like a dream. Unlike its conventional counterpart made with dairy butter, it is a brilliant white color, even if you add real vanilla extract. I’ll be honest and say that IMBC made with palm shortening does lack a certain depth of flavor associated with conventional IMBC; traditionally speaking, the flavor of dairy butter is front-and-center in the flavor profile. However, the texture of this icing is phenomenal, and I encourage you to consider this “blank slate” flavor to be an opportunity rather than a detriment. If you use aqua faba straight from the can, you may find that your buttercream is softer and more fluffy than the conventional kind. If you’re just icing a cake, this won’t be a problem, but if you’re hoping to use it as a base under fondant, you’ll want to make a stiffer version by reducing your aqua faba first. Simmer it gently until it’s reduced to half of its original volume, and measure after reduction. Reduced aqua faba can have a slightly caramelized flavor. 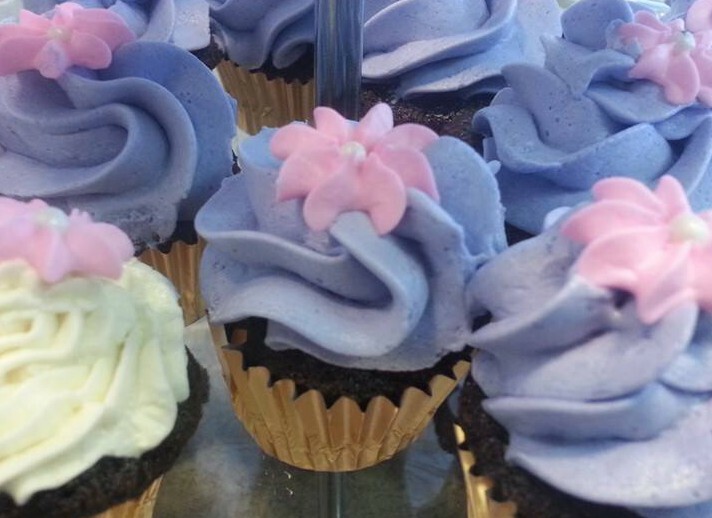 If you’ve never made a meringue buttercream before, the process can seem a little daunting. However, I promise you that your efforts to master the technique will be more than worth it. One word of caution: Don’t undertake this without a proper candy thermometer! You don’t need a whizzy one like I show in the pictures below, but you definitely need one. You’ll need to bring your sugar syrup to a specific temperature, and that’s not something you should guess about. You can learn more about the amazing things you can do with aqua faba by joining the Vegan Meringues — Hits and Missses Facebook group. Stand mixer with whisk and paddle attachments. Place the aqua faba into the bowl of a stand mixer that has been fitted with the whisk attachment. Put sugar and water in a non-reactive saucepan, and whisk or stir until blended. 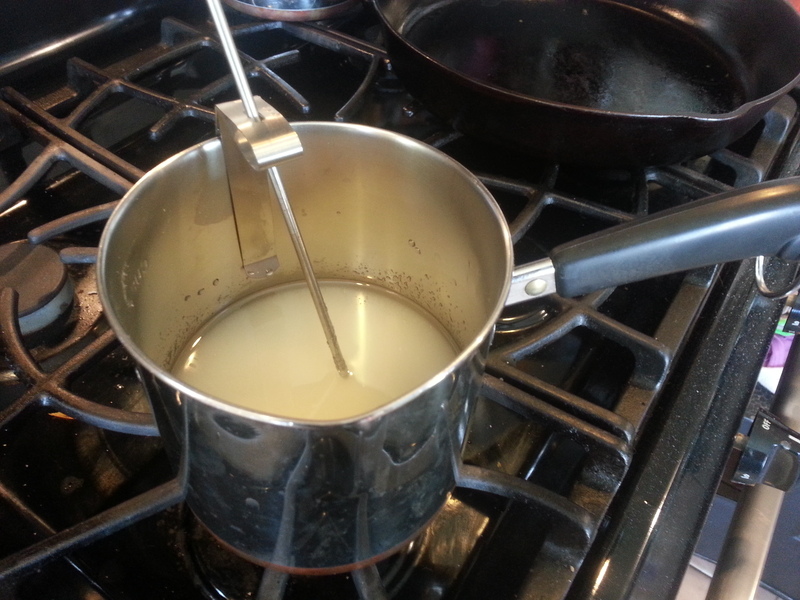 Place the pan over medium low heat until the sugar is fully dissolved. Remove any grains of sugar on the sides of the pan by either a) heating briefly with a lid on the pan, or b) brushing the insides of the pan with a heat-safe pastry brush dipped in cold water. 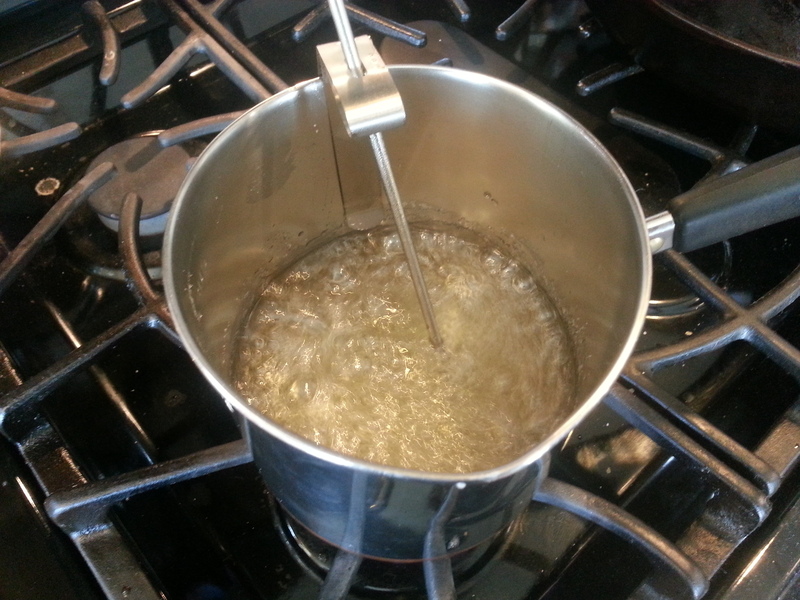 Attach your candy thermometer so that the tip is submerged in the sugar syrup, but is not touching the bottom or sides of the pan, and start the mixer on low speed. At this point, you may increase the stove temperature to medium, or even medium-high if you’re prepared to pay close attention to it. When the sugar syrup reaches the soft ball stage (about 234ºF), turn your mixer speed to high. This is not a magic temperature, and if you’re using reduced aqua faba, you may want to start a little later. 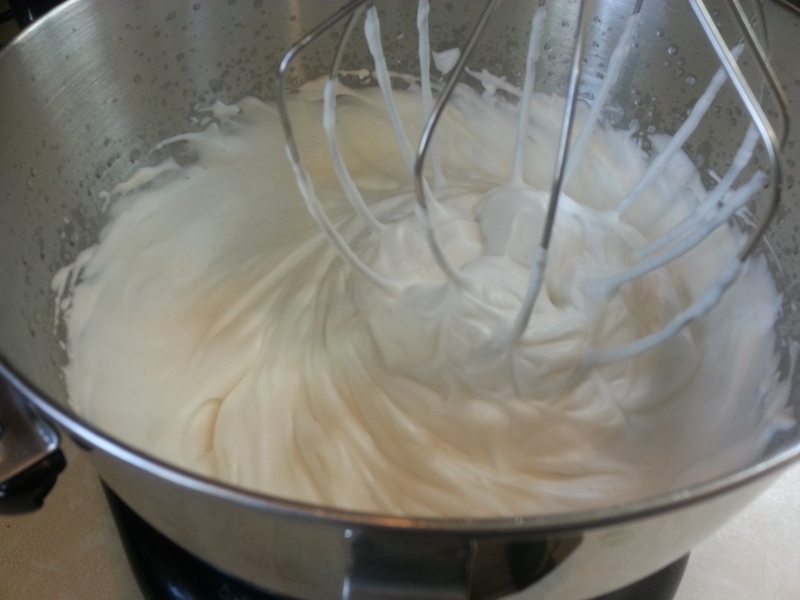 The goal is to get your meringue to very stiff peaks before you add the sugar syrup to it. Exactly when to turn up your mixer will vary depending on your mixer, your aqua faba, and how high the heat is under your saucepan, so start with this, and make adjustments as necessary for future batches. If you are able, take note of the progress of the meringue as your sugar syrup rises in temperature, and turn the temperature down or up to try to get the timing right. When your sugar syrup reaches 248ºF, remove it from the heat and verify that your meringue has reached very stiff peaks. You can wait a couple of minutes at this point if you need to, but try not to wait too long. With the mixer still running on high speed, slowly pour in the sugar syrup, trying to carefully hit the sweet spot in between the spinning whisk and the side of the bowl (otherwise you might splatter sugar syrup everywhere…but don’t worry if you do, just keep going!). Sugar syrup is very hot! Be careful! Your meringue will probably increase in volume as you add the sugar syrup, and when all of the syrup is added, it should be thick and fluffy. At this point, stop the mixer and change to the paddle attachment. Turn the mixer back on high, and keep beating until the meringue has cooled off to room temperature, which can take several minutes. 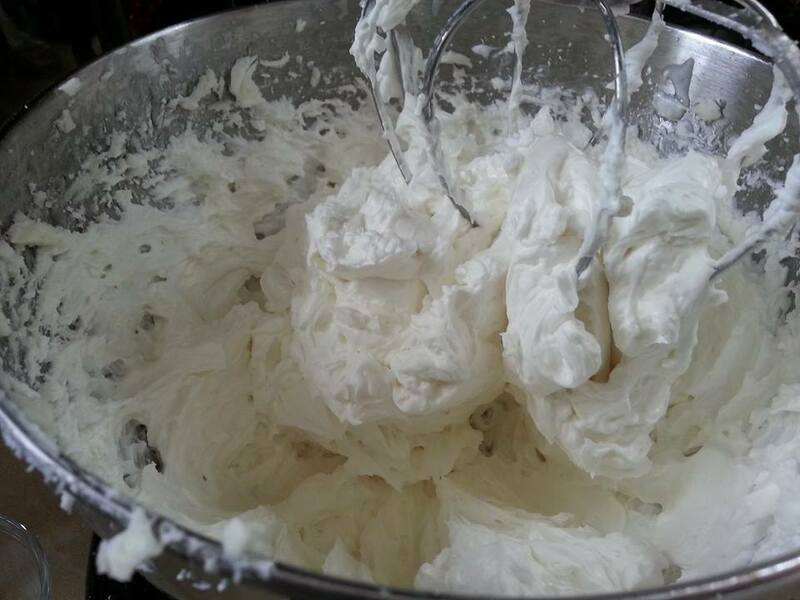 During this time, the meringue will become glossy, and may decrease a bit in volume. Touch the sides and bottom of the bowl to ensure that the meringue is completely cool before continuing — otherwise the heat of the meringue will melt your fat, and you’ll get soup, not buttercream! If you’re impatient, you can speed up this process by putting an ice pack against the bottom and/or sides of your mixer’s bowl. Now it’s time to add the shortening, vegan butter, or other fat. 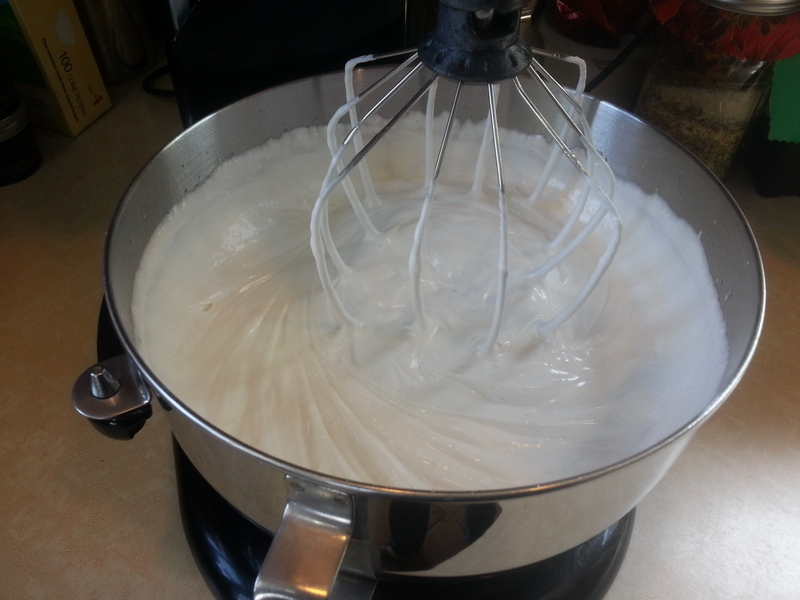 With the mixer still running, add small pieces to the meringue, one at a time. If you’re using shortening in a tub, scoop out spoonfuls and toss them in; if you’re using margarine or other products that come in a stick, cut it into small pieces first, and toss them in one by one. You will probably lose some more volume as you start adding fat, but that’s expected. Note: As you are adding your fat, your buttercream may “break.” (If you’re not sure what this means, don’t worry — if it happens to you, you will know! If your buttercream looks curdled, just keep beating with the paddle, and it should come back together again. If it still won’t come together, especially if it’s a warm day, you may need to cool it down for a bit and try again. Place the buttercream (bowl, paddle, and all) into the refrigerator for a few minutes, then try again. When all of the fat has been added, turn your mixer to medium low and and add vanilla extract or other flavorings. Stop the mixer and scrape down the bowl with a rubber spatula a couple of times, to ensure that your flavorings are well-mixed. Italian Meringue Buttercream stores extremely well in the refrigerator or freezer, so don’t be afraid to make it in advance, or keep some on hand for a rainy day. Just make sure to take it out and allow to fully return to near room temperature before use. Then, beat it in your stand mixer if you need to restore the texture. (*) A Note on Fats: You may be wondering if there are other options beyond 100% palm oil shortening. Surely there are, but as of this writing, I have not fully explored the options. See the notes above for a more in-depth discussion about fat options. 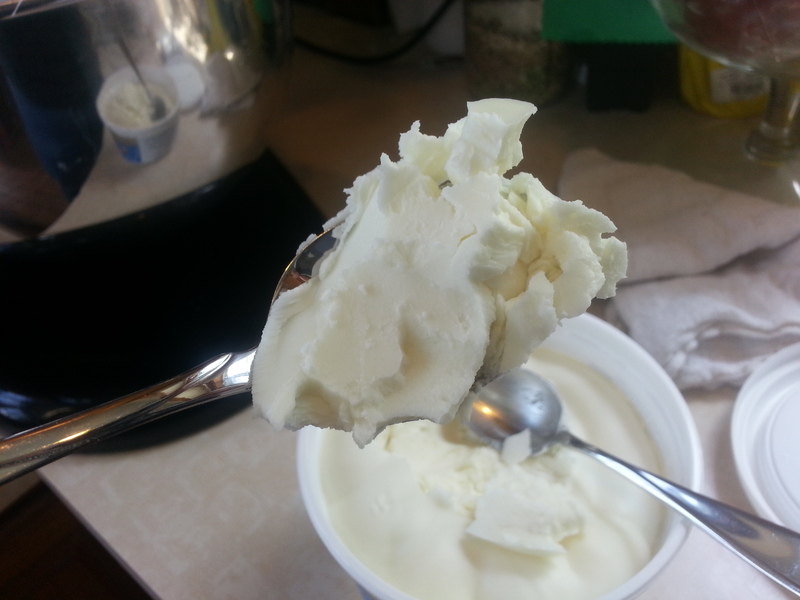 Margarines and butter substitutes that come in a tub are probably not suitable, because their moisture content is much higher than products that are sold in stick form. I will update this recipe as I discover other options that work. This entry was posted in Frostings and tagged aqua faba, dairy-free, egg-free, recipe, vegan. Bookmark the permalink. Looks great! Can you make a video??? Do you think coconut oil would work in place of the palm oil? I fear that coconut oil is too solid at cool room temperature, and then suddenly too liquid when it gets warmer. You want something that is solid but spreadable at room temperature, much like dairy butter is. I have made this icing several times, and only the first was it an actual icing that i would be proud to ice with, I have used coconut oil every time! I used a different process but mine worked perfectly. I skipped the water and sugar heating and just poured the sugar straight into the whipped aquafaba (I used 1 1/2 c vegan powdered sugar). Then added coconut oil tbsp at a time (used around 3/4 c). Once it was combined and curdled I heated it on the stove top until melted, stirred, freezer for 10 mins, stirred, repeat. Allowed to cool entirely in the fridge. Rewhipped it once it was thick again, threw in some vanilla. Perfect buttercream. My cupcakes needed to stay in the fridge if not eaten right away to avoid melting. @sodaceratops what you made is called French meringue buttercream. Introduction of granulated sugar to whipped egg whites is called a French meringue. You just added another recipe all together to the vegan buttercream list. Good on you! @ResaMarie French Meringue is made with egg yolks. Italian and Swiss use egg whites. Sorry, no. The one European buttercream that deviates from the meringue method is German and that is due to the addition of custard. If you need links, I can provide them. I can’t wait to try this recipe! I know you mentioned it stores well in the fridge and freezer, but what if I use this as a cake filling for a fondant covered cake? Does the fondant covered cake have to be stored in the fridge as well, or can it sit out while being decorated and before being served? This recipe can sit out for quite a while. A fondant-covered cake will keep even longer. Don’t worry about decorating the day before and leaving it at room temp. Putting fondant in the fridge can damage the shine, so be careful! Thanks for the quick reply! I’ve never put my fondant covered cakes in the fridge, so I’m glad I don’t have to do that if I use this recipe for the buttercream filling! YAY! I usually fill the cake with buttercream and then frost with ganache (I’m looking for a vegan option for this too!) and it set firm over night, cover and decorate the next day, serve the day after that. Would this be too long at room temp in your opinion? AJane did you ever try leaving it out that long as you stated serving on the 3rd day? I’m curious if it holds up as well as regular IMBC. I have served the next day, and the leftovers have remained on the counter sometimes for a week. The cake will go stale or moldy before anything goes wrong with the buttercream. If you add fruit puree or something, that’s another story, but un-altered it’s fine. To Ajane.. make vegan ganache by subbing real coconut cream for dairy heavy cream and vegan chocolate. Store cans of whole fat coconut milk in fridge and scoop out the cream that rises to the top. Melt the chocolate and cream together in the same ratio as non vegan recipes. This can be whipped, used for truffles, or poured as glaze. Thank you so much Nedra–I’m so excited to try this for vegan ganache! Is the coconut flavor strong/obvious in the chocolate? And will it set firm like regular 2:1 ganache for under fondant?! Sorry.. haven’t been on my computer much. I use Njoy vegan semi sweet chips and my coconut hating kids liked it! It hardens just the same as dairy ganache – same ratios, although I’ve never used under fondant, I would think it should work. Maybe make a small cake just to see (and taste). AJane, If you use refined coconut oil it will have no coconut flavor. It’s the virgin/pure coconut oil that you can taste coconut. I wonder if a mixture of cacao butter and coconut oil would work as a substitute for the palm oil? The cacao butter I have is solid even at room temp, and I agree that coconut oil melts a little too quickly, but maybe together it would work. I might even try it today if I have time, great excuse to do some baking. Hi Natalie, I’ve been wanting to try using cocoa butter, but all I can find is cosmetic grade in stores. Where do you get yours? I found some online – but I’d purchase from a store – at least to start. Thank you! I have developed a recipe for a palm oil-free shortening: http://veganfeastkitchen.blogspot.ca/2015/04/my-new-palm-oil-free-rainforest.html It holds up well in a frosting at room temperature, even though it contains liquid oil, because cocoa butter is so hard. If you live in the USA you can get fair trade organic steam-deodorized cocoa butter from Chocolate Alchemy in Oregon for a good price. Cocoa butter will keep for 5 years, so you can save money and get a large amount (or share with others). They ship to Canada, but, right now, our dollar is so low that the American price is un-affordable. I have bought from them several times, though and will again when our dollar is par. Thanks, Bryanna! I’ve been meaning to try cocoa butter shortening, but I haven’t had a chance yet. I love the idea, since you could use it in either deodorized or virgin varieties, depending on what you’re aiming for. I’m glad to hear that it worked…and that I can check out your recipe rather than needing to develop my own! Hi, Nedra and Natalie. I recently learned that cacao butter (kuh-COW-o) is the raw, virgin oil from the cacao bean. Cocoa butter, on the other hand, is the *REFINED* oil from the cacao bean. Depending on how it is refined should determine whether you want to put it in – or on – your body. Many processors use toxic solvents (i.e. hexane, toulene, etc). For health reasons, I decided on certified organic cacao butter made by Sunfood Superfoods. Knowing the difference, I was able to make the right choice. I’d like to make an espresso flavored buttercream – can I just add some espresso or do you think the butter cream would become too soft? You can make espresso-flavored buttercream. I use 2 Tablespoons of espresso powder (usually found in the coffee aisle of your grocery store) mixed with 2 Tablespoons of warm (not boiling!) water for every 3 cups of IMBC. See my comment above in answer to Nedra about a homemade palm oil-free shortening I developed. I just tried this. It was looking great, stiff white peaks, glossy when I added the sugar water at perfect temperature. Stirred the mixture until it was back to room temp, added the (palm oil free) vegan margarine and coconut oil and wham- I have soup. Putting in fridge to see if it will firm up but there is no way this will ice a cake. Have no back up plan here so going to have to run 15 minutes back to the store and just use the vegan cream cheese/powdered sugar /vegan butter version that I usually do. bummer, I was hoping this would work and really don’t want to go back to the store! I had the same problem, even following the recipe exactly as written, with the palm oil shortening. It was gorgeous before the shortening was added; now it looks like cottage cheese, and no amount of whipping or chilling will fix it. Super disappointed. Hold on–I spoke too soon! I think the problem was the mixture wasn’t cold enough to begin with, but then we cooled it off a bit too much. We gave it a warm bath to de-solidify the shortening, and whipped the heck out of it, and now it’s BEAUTIFUL! So shiny! Delicious too. That’s great news! More often than not, IMBC can be “brought back.” It’s finicky for sure, but as you’re learning, once you really come to understand it, you can usually make it right. It’s definitely worth the effort! Pingback: Aquafaba: 15 things you need to know about the latest vegan trend - How to do everything! The first time I tried this recipe I used coconut oil. I thought because it’s a solid at room temperature it might work but it didn’t. After adding the oil it crashed and never solidified, even after being in the freezer. It tasted amazing though and I finished the whole batch on toast or with a spoon by the next day. I tried it again yesterday with 100% palm oil and it worked beautifully. I made it a day in advance so stored it in the refrigerator. Today though it was hard as rock so I left it out for a while until it had softened, but the frosting separated and turned chunky! I tried whipping it back up but it never came back to the beautiful smooth texture. How could I fix this? Hello, this page is invaluable – thank you so much Geeky Cakes and commenters. Just writing here with anothet fat alternative – a coconut version subbing the fat with 10oz solid coconut oil and 14oz creamed coconut (the solid stuff that comes in a block). It’s very coconutty but in this case it was meant to be – I also added 4tbsp rum at the end. I melted the fats together first then left them to set in the fridge in a shallow tray, taking it out when it was still a bit soft. I’ve made three batches the same way (it’s a big cake!) and all have worked. But yes, very coconutty! I make an ‘unbutter’cream with Earth Balance. It’s closest to butter that I’ve found and I just make it like a regular buttercream. Half a tub with 3 cups vegan icing sugar, 1 tsp vanilla, dash of salt and non-dairy milk added a tbsp at a time to get the proper consistency. It holds up really well. Adding fruit for flavouring will water it down considerably but basic flavourings it does beautifully. Palm oil is such a filthy business…… it’s not only elephants but orangutans and sun bears and every other living creature. Even the sustainable stuff is a dirty business as other equatorial crops are being ripped up and replaced with palm oil plantations, which drives up the price of crops such as cacao. Palm oil is more lucrative and quicker to market….. honestly, this world we live in – it’s so difficult to be consciencious. (which I cannot spell, lol). I’m off to try cocoa butter. The aqua faba whips up beautifully but the palm oil was gross! Too greasy. Hi Linda, quick question: If I’m frosting a cake the night before the party, should I keep it in the refrigerator overnight? Would this be stable overnight on the counter? Thinking of using a combo of vegan butter and shortening, too. I leave my IMBC cakes out all the time, unless I add in fruit puree. The cake will go bad before the buttercream does. Enjoy! I’ve made this before and it turned out great! This time, I wasn’t thinking and I added the fat while the sugar/aquafaba mixture was too warm and I got soup (as you said can happen)! Is there any hope of salvaging the mixture???? Try cooling it down (put the whole thing, bowl, paddle, and all, into the fridge for a while) and then try whipping, whipping, whipping. Start it whipping and walk away for a while. Sometimes this works. Hope for the best! Thanks… I didn’t have too much time, so I put it all in the freezer for a bit. The texture was all wrong and was a major bummer! I added a bunch of powdered sugar to try to help it along… it did end up working as a nice filling for my cupcakes, but was not really pipeable for decorating. Will see if re-whipping the leftovers tomorrow works after being in fridge all night! I love this recipe and when I’m not an idiot and toss the shortening in while it’s still warm, this recipe is amazing!! Hi Linda, do you think this would work with regular crisco? I need a really stable buttercream to frost a vegan wedding cake (tall layered cake that will sit out for several hours on what may be a very warm day) but options for shortening and vegan butter alternatives are super limited in Australia, so at a bit of a loss! Your recipe is sounding by far the most promising if I can only find a suitable shortening… thanks! I really wouldn’t recommend Crisco for this — I think it would taste bad and have an extremely greasy mouthfeel. Crisco is absolutely great for some things, but “eating it straight in large quantities” isn’t one of them! I know this would add to the effort and the expense, but would you consider making your own shortening out of cocoa butter, as others have suggested above? I haven’t tried it myself, but I understand that it’s quite successful. Do you have “high ratio” shortening where you’re located? Again, I haven’t tried it, and I wouldn’t recommend using it for 100% of the fat. If you must, try using some Crisco along with something else to try to improve the flavor and mouthfeel. Let us know what you end up using, and how it works out! I actually made imbc with aquafaba before i stumbled across thos recipe, and its the best icing ever for piping intricate stuff like flowers. I wonder if trex would work with this. Rubina, when you way “it’s the best icing ever” do you mean THIS one or the other one you did before? I need one that really holds shape for buttercream flowers. I tried your recipe this weekend. Thank you so much for the tip of sticking it in the fridge if it wouldn’t come together. Worked perfectly! Oh, and the next day I had a total flop trying to convert a recipe for peanut butter mousse, then I had a brilliant idea. Since this is smooth and silky like mousse I rewhipped the leftovers with a bunch of peanut butter and some powdered sugar and it made a fantastic peanut butter mousse!!! Make sure to let it come up to room temperature before you use it, and you’ll probably want to give it another whipping with the paddle attachment. These makes a great base for vegan cream cheese frosting. After making a full batch of vanilla IMBC, I add Kite Hill cream cheese and lactic acid powder to taste (lemon juice would work, too, but I think the lactic acid is more “cheesy”). Prior to doing this, I went through batch after batch of failed vegan cream cheese frostings–either way too runny or way too sweet. With IMBC as the base, it was just right. much cream cheese did you add? I just made this. It is amazing!!! I added 1 C of powdered sugar at the end because my family thought it wasn’t quite sweet enough. My new favorite frosting recipe. First of all, this is my FAVOURITE frosting recipe! I’ve made it a few times and it has come out wonderfully every single time 🙂 I just follow the recipe to a T.
This time, however, I need to make a brown coloured frosting for a monkey cake design (which I’m guessing means I have to make it chocolate). Can I just add some melted (and cooled) chocolate chips at the end and whip it to combine? Has anyone tried this yet? Or, if anyone knows how to make this frosting brown without making it chocolate, please let me know! For chocolate IMBC, add about 2 ounces of melted-and-cooled chocolate per 1 cup of buttercream (melt the chocolate, and when it’s cooled to room temperature, but still liquid, beat it in). If you want to make it brown without making it chocolate, I would use food coloring. That’s what it’s for! Everything was going well until I switched to the paddle attachment and turned it back to high without paying enough attention— meringue went flying 6 feet across my kitchen in various directions. I lost a fair amount of meringue in those few seconds so when I added in the fat (regular butter as we aren’t vegan) I knew I needed to reduce the amount but still ended up adding too much. Alas it ended up tasting too much like pure butter and my attempts to save it just made things worse. Next time I will make sure to stay at the penultimate speed setting. Thanks for the recipe! I’ve been having fun lately playing with aquafaba; so, I thought I’d try making this for my wife’s bitrhday cake today. 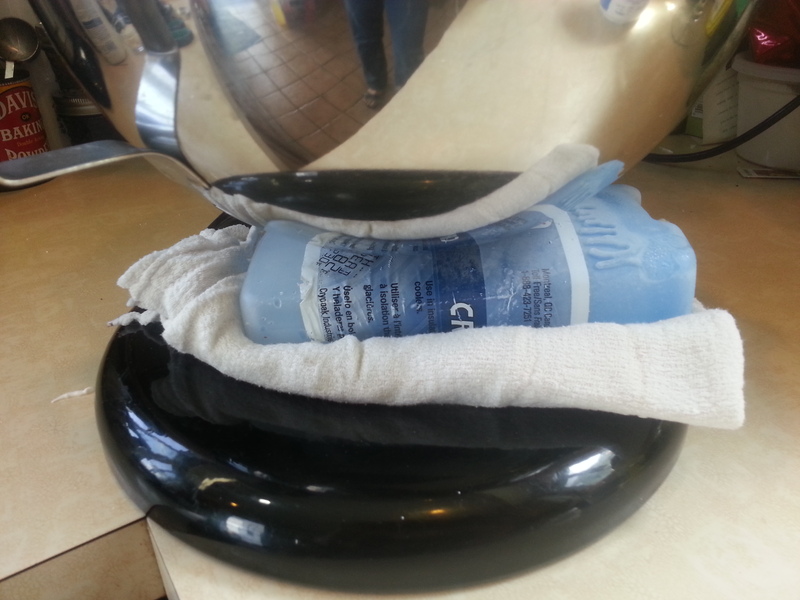 Unfortunately, I found we were out of shortinging … so, I figured I’d try with our margarine (Smart Balance) instead. While it seemed to work texture-wise, the flavor is roughly like eating a stick of fluffy butter. I’ve never had actual IMBC, but I suspect this is not the desired outcome. Next time I’ll be sure to take the time to run to the store for the shortening … just thought I’d post a warning in case anyone else thinks of trying it with Smart Balance. I tried to salvage it by adding some melted chocolate and a little more vanilla, but that just resulted in a slightly chocolaty fluffy butter flavor. I also found out that cocoa powder won’t mix in well … juends up speckled. Any ideas on anything else to try with my failure (other than maybe spread a little on a bagel)? Seems a shame to throw it out, but I don’t think it’ll go well on a cake.